Ada Powell Smith was a resident of Central Square who passed away in 1955. She took on many projects which would better our village and those who live here. She was a lover of books, nature and the art. The 21.6 acre nature Park on State Route 49, named for Mrs. Powell, was designated to remain forever wild, and consists of wetlands, scenic overlooks, an open field and streams with various wildlife and plants. Since about 2006 a lot has been happening at this park. First was an Eagle Scout Project (by Brad Harringer) to create a nature trail and remove a dilapidated bridge which had become a hazard. This project was the first step in cleaning up the park so it could enrich the lives of many just as Mrs. Smith had so many years ago. The Nature Trail was completed in September 2006. In May 2007, Trustee Heather Stevens with the help of Mr. Ken Kristensen secured a grant through Constellation Energy to build planters across the front of the park. Also a grant was received from Walmart to help with the planters and other park projects (Eventually a pavilion). The Village and local scout troops built, planted and maintain about 6 large flower boxes in front of the park. 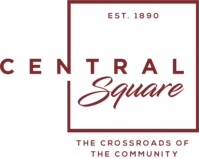 Project Bloom of Central Square donated 4 large planters for the front of the park also. In the Fall of 2007 Project Bloom volunteer Laura Turner planted hundreds of daffodil and tulip bulbs along the sidewalk and they are a great burst of color each spring. In April 2008 Cub Scout Pack 709 completed and installed 20 bird and 4 bat houses at the park. Then Eagle Scout Ryan Allen of Troop 709 completed his project and dedicated the new bridge at the Ada Powell Park on June 14, 2008. This project allowed for further improvements and development of the park past the stream area. In October 2008 a strong storm came through and downed a lot of trees at the park and the village had to close it until the spring of 2009. Once the trail and park were cleaned up volunteers jumped to work at the annual spring clean up. Projects started up again too. In May, local science teacher, Chris Cox brought his class to the park and planted evergreen seedlings and had some first hand classroom teaching in the park. In June 2009 two local Girl Scouts built and installed benches as their Bronze Award Project at the park. June also brought the installation of the new sign donated by John and Doris Hasto. The village built a new flower box at the base and Project Bloom members from the Stevens and Mallory family acquired plants and planted the box. Diane and Ron Mallory, as well as Project Bloom, maintains the flower box. The most recent improvement has been a small pavilion that the village has built near the nature trail, parking area and installed a park rules sign. The pavilion area will be used for family picnics and educational workshops. We also have Boy Scout Mark LaPoint beginning his Eagle Scout Project at the park this fall. It is to extend the trail system. This park is really a great hands on community project! Dogs are allowed in the park, however they must be on a leash (8 feet or less) and you must clean up its waste and dispose of it properly. No pets or other animals shall be allowed to become obnoxious, aggressive or disturbing to the other users of the park. There are no campfires or burning in the village. No motorized vehicles or motorized toys are allowed in park. All firearms, fireworks, slingshots, bows and arrows, blowguns, crossbows, air guns, rockets or any other similar devices, recreational or otherwise, are prohibited. This is a non-smoking park. 1. To accommodate people of various age groups and learning abilities. 2. Design trails that are sensitive to maintaining the integrity of the area with minimum impact on soil, ground covering and water quality. 3. Design the park to enhance wildlife viewing and raise awareness of parks features. 4. Make people more aware of the contributions of Ada Powell and why she is/was important to the village. 5. To promote a deeper understanding of the cultural and ecological history of the park. 6. Design the park in a way to encourage participation of area residents. 7. Involve the youth in the construction and maintenance of the park.